The Rack-mount version has 2-Channels with 6-Modes… any of those channels/ modes are available and selectable separately via front-panel toggle switches or via six ¼” phone plug tip-to-ground contact closure connectors on the rear-panel. Those rear-panel connectors also allow you to mix Channel 1 modes with Channel 2 modes to get different sounds using an external control switcher and activating two of the Tip-to-ground contact closure connectors. 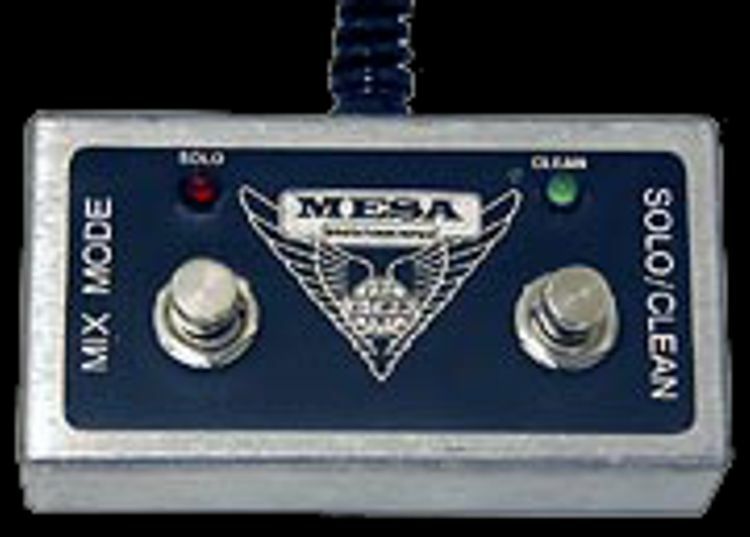 This rear-panel Tip-to-ground connector panel was an option from MESA©, my second-hand preamp did not have the connector panel, just a blank cover plate, meaning that all channel switching had to be done manually from the front panel or with the included 2 button footswitch. I fabricated a custom rear panel and installed a MIDI to Switch PCB for the MIDI Control of the V-Twin Modes. The rear panel includes a MIDI IN, MIDI THRU and an 8-pin MULTI Connector for connection of the below Custom Footswitch. A Phantom Power Jack connects DC on pin-6 and pin-7 of the 7-pin MIDI IN Jack to feed remote power to a MIDI Foot-Controller. This custom Footswitch allows the user to Mix Modes from the two Channels as well as allowing the user to Mute one or both Channels. It is Phantom Powered from the External Channel Select Panel 8-pin MULTI Connector. After inspecting the V-Twin circuit board, I noticed some burn marks on the PCB around some 3 Watt resistors near the power supply. To increase the reliability, I removed those 3 Watt resistors, cleaned the PCB and replaced all of the power-resistors with 5 Watt Versions. I didn't want to further load the existing V-Twin transformer/ power supply with the new MIDI Control Board, so, I installed a separate circuit board with a torroidal transformer, rectifier & regulator to power the MIDI control Circuitry separetely. Those power resistors still got hot so I ventilated the chassis by cutting vertical slots in the chassis and added a small 5 VDC brushless fan to blow cool air over the resistors... much cooler now.